I had to wait a little while for an article to confirm, and when it did come, it came in French. Bill Watterson, creator of Calvin and Hobbes, huge inspiration to this here blogger, first cartoonist to win the Tour de France, received the prestigious Grand Prix at one of the biggest comics festivals in the world. It seems as less of a surprise than it would have been a few years ago. Lately it seems ol Bill’s work is getting more of the attention it deserves. In 2005 we got The Complete Calvin and Hobbes, a hardbound three volume set that collects the run of the strip in its entirety. Better still, it included a preface by the author. Clocking in at about 20 pages, it was the most autobiography I’d ever seen from Watterson. In 2009, Looking for Calvin and Hobbes popped up as a sort of meta-article on the elusive cartoonist. Although Nevin Martell interviewed just about everyone associated with Watterson, he was unable to speak with the man himself. On the record, at least. Last year came Dear Mr. Watterson, a documentary on the lasting legacy of Calvin and Hobbes. This was not another biography of the man but a love letter to his work. I am proud to have been included in such a nice tribute to my favorite work of art. With all these publications, Bill Watterson has been thrust once again into the spotlight. Let us hope he is not too angry at us for loving him so much. I doubt he is too bothered by it, as he has voluntarily taken part in two projects of late: one, a book called The Art of Richard Thompson, will feature an interview between Watterson and Thompson. In March, an exhibit of both Thompson and Watterson’s art will go up at the Billy Ireland Cartoon Library & Museum at The Ohio State University. 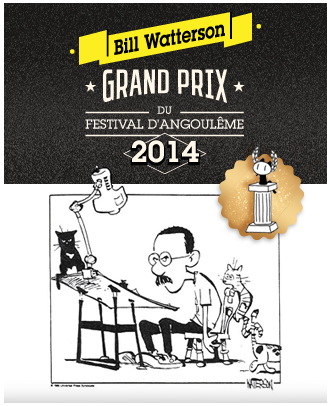 Amid all this renewed interest, it makes sense that the judges at Angouleme to award Watterson their highest honor. Everyone wants to know: will Bill Watterson attend Angouleme next year? According to his editor Lee Salem (a superstar of the comics scene himself), “I’ll try to talk him into it.” I don’t know about you, but if I was in Ohio in late January a trip to France would sound pretty darn good.